The AGM-45 Shrike was the first dedicated air-to-surface ARM (Anti-Radiation Missile, sometimes also called Anti-Radar Missile) of the U.S. armed forces. It was used in very large numbers by the USAF and the U.S. Navy, until being replaced by the AGM-88 HARM. Development of the Shrike began at the NWC (Naval Weapons Center) in 1958 under the designation ASM-N-10. The missile was intended to counter the threat of the then new Soviet S-75 surface-to-air missile system (known to the NATO as SA-2 Guideline) by homing on the emissions of the SA-2's "Fan Song" guidance radar. 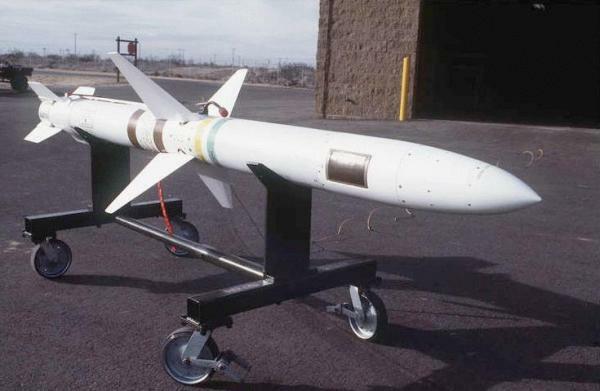 The ASM-N-10 was based on the airframe of the AAM-N-6/AIM-7C Sparrow III missile, but had a larger warhead, smaller rocket motor, and smaller tail fins. In June 1963, the ASM-N-10 was redesignated as AGM-45A, and large-scale production of the initial AGM-45A-1 model for the USAF and the U.S. Navy began at Texas Instruments and Sperry Rand/Univac. It entered service with the Navy in 1965. The AGM-45A was used in combat by many different types of tactical aircraft in South East Asia, including the A-4, A-6, A-7, F-4, and F-105G. It was powered by a Rocketdyne MK 39 solid-fuel rocket motor (or Aerojet MK 53 MOD 1 in some missiles), and was controlled in flight by its forward cruciform wings. It could use three different blast-fragmentation warheads, the 67.5 kg (149 lb) MK 5 MOD 0 and MK 86 MOD 0, and the 66.6 kg (147 lb) WAU-8/B, and employed a dual-mode (proximity and impact) fuze. The ATM-45A was a training round with the motor and seeker of the AGM-45A, but with an inert warhead section. The original mode of operation was to send the Shrike on a lofted trajectory (for maximum range) towards a suspected SAM site. As soon as the missile had passed its peak altitude and started to come down, its seeker would detect the site's radar emission and home on it. Although it was used at least with some success in the Vietnam conflict, the AGM-45 had a number of serious operational drawbacks. Most importantly, the seeker was tuned to a fixed frequency range, so whenever the enemy deployed a new radar operating on a different frequency, a new seeker variant for Shrike had to be developed. The led to a long line of sub-variants of the AGM-45 (tabulated below), and of course meant that the mission planners had to know in advance which types of threat radars would be encountered. A second problem was that the seeker was not gimballed and had a fixed and rather limited field of view, so that the Shrike had to be aligned almost perfectly towards the radar emitter to detect it. The third limitation of the AGM-45 was its lack of any kind of on-board target memory. When the SAM site shut its radar down (because Shrike-equipped attackers approached), any missiles already fired would lose lock, and go ballistic. However, the Shrike could be considered semi-successful in that case, because without a radar, the SAMs wouldn't guide either. The AGM-45A-2 had a seeker tuned to a different frequency band and introduced a white phosphorus target marker in the warhead to mark the impact point. The AGM-45A-3 (as well as all later variants) employed angle gating to prioritize the target. Field modification of the guidance unit enabled the Shrike to be used in line-of-sight attacks. The attack aircraft could dive straight towards the SAM site with an activated AGM-45, which would be fired automatically as soon as the seeker picked up a radar emission. 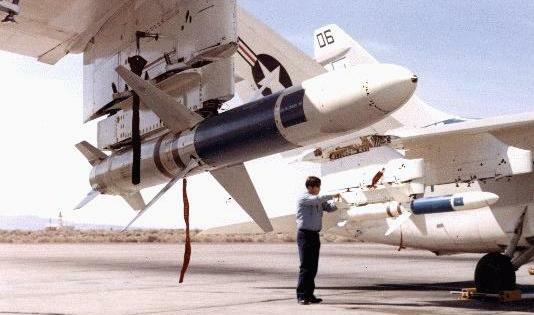 The designation AGM-45B applied to Shrike missiles with modified warhead and motor, introduced in the early 1970s. The AGM-45B used an Aerojet MK 78 dual-thrust (boost/sustain) solid rocket, which significantly increased the maximum range (high-altitude lofted trajectory) from 16 km (10 miles) to 40 km (25 miles). The warhead was either a MK 5 MOD 1, MK 86 MOD 1, or WAU-9/B. The ATM-45B was the inert training variant of the AGM-45B. The Shrike was also exported to several countries, and some used it operationally, including Isreal against Egyptian SA-2 Guideline and SA-3 Goa SAM sites. When production ended in 1982, about 18500 AGM-45 missiles of all variants had been built. 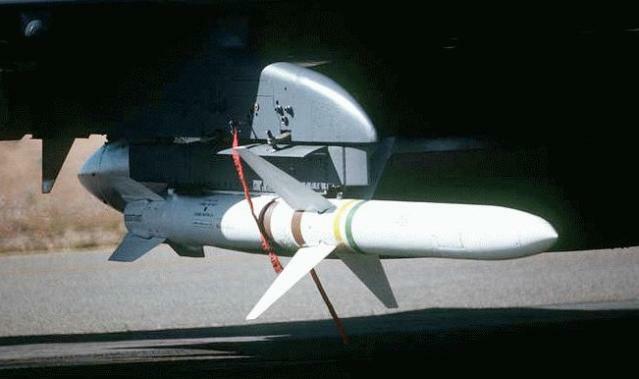 In U.S. service, the AGM-45 was gradually replaced by the much more versatile (but also more expensive) AGM-88 HARM (High-Speed Anti-Radiation Missile), and the last Shrikes were withdrawn from U.S. inventory in 1992.